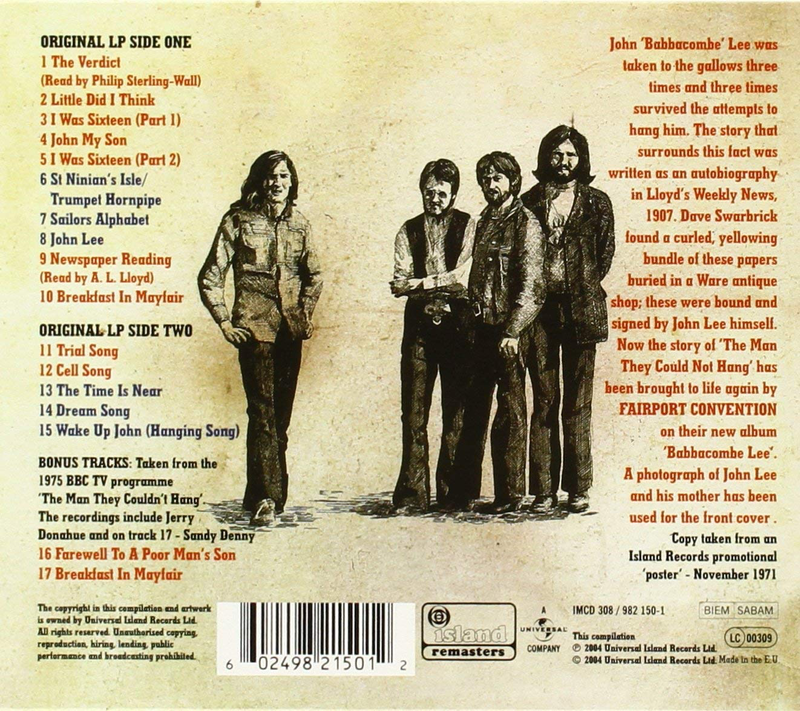 This was the first "folk rock opera" or "folk concept album" as such. Released in 1971, it threw Fairport Convention's fans somewhat in that it was a series of narrative songs detailing the life of John "Babbacombe" Lee, a Victorian murderer convicted to hang but reprieved because the gallows failed to work properly three times. A quite incredible story of good fortune for a man who was probably a pretty unsavoury character, yet gains our sympathy throughout the album. Lee brutally murdered his landlady, yet bizarrely I find myself feeling sorry for him as his tale is narrated. The group is now all-male and the vocals are all strong, vibrant and harmonious, sung in that traditional English, rural real ale-drinking, bearded "folk" style. It is an atmospheric, interesting album and the instrumentation is lively and impressive on the fiddle-dominated, upbeat numbers such as the two parts of "I Was Sixteen" and the sailor's hornpipe jollity of "St Ninian's Isle" which sounds very like the theme tune to sixties children's TV show "Captain Pugwash". "Sailor's Alphabet" is another seafaring song. 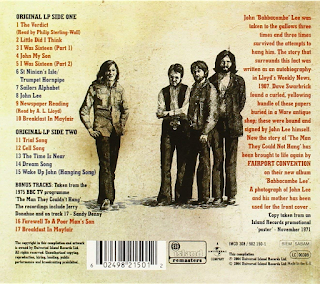 There is a lot of these type of songs, as Lee was a Devonian and had a navy background in his early life. It has a great fiddle solo on it near the end. "John Lee" features some electric guitar jangling riffage and proper rock drums. There is some fetching guitar on "Breakfast In Mayfair". 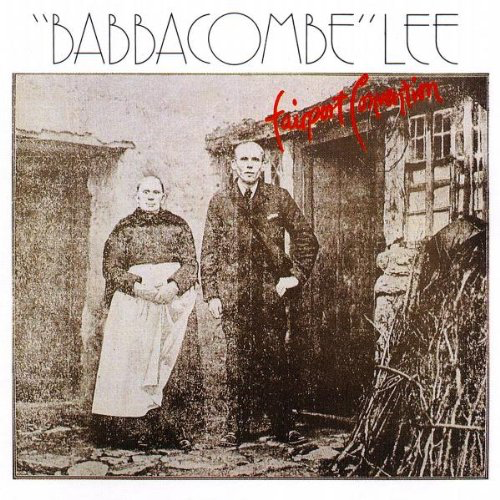 The old "side two" sees the "John Babbacombe Lee" refrain repeated a lot through the rocky "Trial Song" and there is a moving, plaintive song about Lee's incarceration, "Cell Song" that features a lovely fiddle solo. The punchy "The Time Is Near" is powerful and haunting. Once again, some killer fiddle enhances the song. "Dream Song" has a sumptuous bass line and some Beatles-esque ethereal vocals. The final song "Wake Up John (Hanging Song)" has the by now ubiquitous fiddle virtuosity as we hear of Lee's remarkable survival. After the successes of "Liege And Lief" and "Angel Delight", the album sold disappointingly. Obviously the concept did not take off. That is sort of understandable, although I quite like it and dig it out every year or so for a pleasant enough listen, like watching an old film every now and again.